What are PCIe 3.0 x16 riser cards? What’s best for mining? As we have mentioned and discussed many times before, Graphics card holds great importance when it comes to crypto-currency mining. Before dedicated mining motherboards like MSI Z170A Gaming Pro Carbon were released, miners were looking for different methods for using additional graphics cards in their mining rig. Using PCIe 3.0 x16 Riser Cards is one of such ways. Today, we are discussing many factors related to this PCIe 3.0 x16 riser cards and their use in crypto-currency mining. In this discussion, we will go through a detailed introduction to these riser cards, how they function, and what is their impact on overall mining performance of your mining rig, good or bad. So without any more delay, here is a quick intro to what are PCIe 3.0 x16 riser cards. These cables, also referred as GPU miners use PCIe riser cards. They allow connecting multiple video cards on a motherboard by lifting them off and away from the motherboard. What’s The Advantage? Well, it makes cooling much efficient and increases the lifespan of these cards, as well as other components of the mining rig. Moreover, the decreased amount of heat allows the miners to optimize these cards for running at possibly higher speeds. PCIe slots on any motherboard come in two sizes referred as PCIe 1x and PCIe 16x, you have to buy a riser card with appropriate size to your motherboard. Most of the video cards are designed to utilize the 16x size on the motherboard. This slot allows 16 connections of dedicated lanes on the motherboard, and that is why it is referred as a 16x slot. It is ideal for increasing performance in gaming environments. The 1x size allows only one connection per PCIe lane at a time. This might affect performance while gaming, but it does not harm mining performance at all. Some of these riser cards come with powered cables. When you connect a video card directly to your motherboard or through extension cables, they consume power directly from the motherboard. Unlike that, powered cables come with additional Molex connectors to plug into the cable. It supplies a 12-volt line to the graphics card. This way, the graphics card does not consume any power from the motherboard. It might boost up power efficiency of other components somehow; we are not sure about that. Do they require separate powered connector: It depends what kind of system components are you using? If you are using lower performance video card, which usually does not apply PCI-e power supply connectors, you will require a powered connector. Most of the high-performance video cards use a PCIe based power supply. It reduces the load on the motherboard. Some motherboards offer a Molex connector build directly into the board, which can be used to power the PCIe slots and you will not have to invest in a separately powered riser. Do PCIe 1x Slot Reduce Mining Performance: While gaming, 1x slot reduces the performance, however, while mining, the performance is not reduced at all, even when using 1x slot. Is a user of riser cables harmful for other components: Basically, they can damage your components if misused? They can possibly short circuit your video card or the motherboard itself. However, it is implausible to happen. The connector must be firmly plugged into the motherboard and to the video card, to avoid any damage. Do they require installing additional drivers for a motherboard? : The simple answer is no. Most of the riser cards available out there in the market are plug and play devices, so no additional drivers are required for using them. As we discussed, Riser Cards have set a standard for building mining rigs loaded with multiple GPUs. There are numerous variations of these hardware parts available out there in the market because every miner wants to save costs on the hardware to squeeze maximum profits from their system. However, you don’t want to go for a low-quality extender and put your equipment at stake for saving a few dollars. 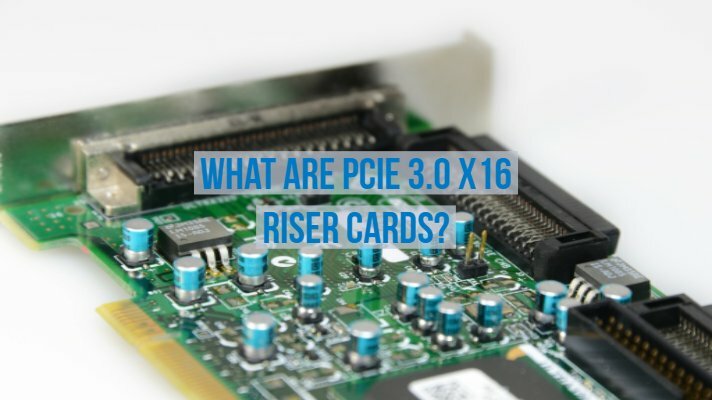 Thus, we decided to add this Tips / Advice section which covers how you should pick these riser cards and also what are some common issues you are likely to encounter while using this piece of hardware. What the kit consist of? It might sound weird, but many of PRO miners and experts in crypto-mining have experienced that Riser Cards are having black or blue colors usually have better build quality compared to the green ones. We are not sure how factual this information is. But one thing is sure; even if there is 5% of this being true, we should take it. So try to go for black or blue color and try to avoid the green one. Being the main components of the PCIe riser cards, this is where things are most likely to go wrong. The main issue causing most of the problems in main board is improper soldering of elements. So to keep your stuff, always verify that solder joints are adequately done, make sure everything makes good contact with PCB. Especially, check the voltage regulator is soldered correctly. If it’s not, everything will seem to be working correctly, but the image will not be displayed on the monitor. Moreover, there are many cases where wrong LDO regulator is soldered. Besides proper soldering, you might also verify that there is no solder leakage on the main board. Make this sure around power connectors especially. It causes the internal power protection to get triggered. It will not let the thing turn on at all and will immediately shut down when you try to power on the system. The smaller PCIe board is less likely to throw any problems at you. However, lousy soldering of the USB connector on it is the only thing that may cause the problem. Still, this problem can easily be fixed by re-soldering the pins of the connector. Besides this, there is not much you need to take care of. However, you can use a multi-meter to check connection points on both boards through the USB cable to make sure if there are any issues. There are a lot of different types of USB 3.0 cables used with PCIe to riser cards. However, any of them are very unlikely to have any issues. If your kit is giving any problem, the cable is probably the last thing you should check for figuring out the issue. The wires are used for only transferring the data and not the power. That’s why the board has a separate power connector. There is no USB connectivity support with these boards though. The only reason to use a USB 3.0 cable is that they provide a good quality shielded wired connectivity. If you try to plug a video card into USB 3.0 slot, it won’t work that way so, don’t bother trying it. As we mentioned before, there are different types of power connectors available for PCIe to USB 3.0 extenders. This makes it pretty confusing for new miners to select the right option. However, it is always best to go for a 4-pin Molex power connector. Moreover, make sure you connect no more than two extenders to a single power line. Doing so will cause an issue for the modular power connector on the power supply side resulting the plastic of the connector to melt. As far as the power connector itself is not broken, there is no possible issue besides a loose connection. If you are still confused, go for a 4-pin Molex power connector even if you have to use the supplier Molex to SATA power adapter. We hope this post helps you to understand the functionality of these PCIe riser cards and help you to choose a functional quality component for your mining rig. Check out our other articles revolving around Crypto-mining if you need further assist in determining right mining components and start in Crypto-mining. For any queries or suggestions, feel free to use the comment box below, Thank You!